One solution for all the essential tools to start your digital marketing agency. Already a Partner? Click here to see how you can use the plugin. 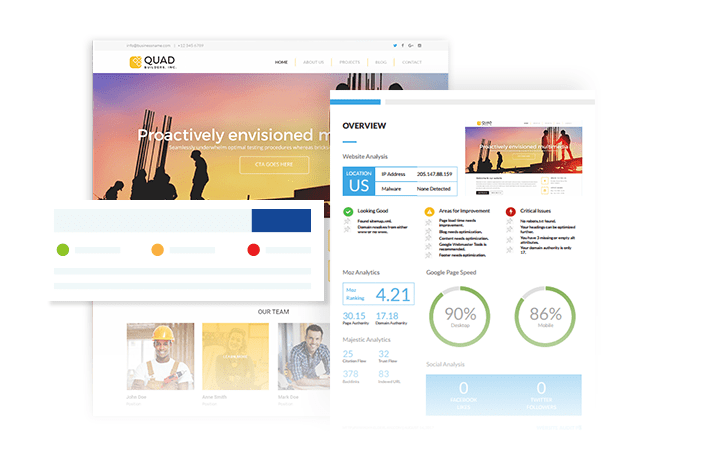 Elegantly designed, rigorously tested WordPress plugin created specifically to grow agencies, worldwide. 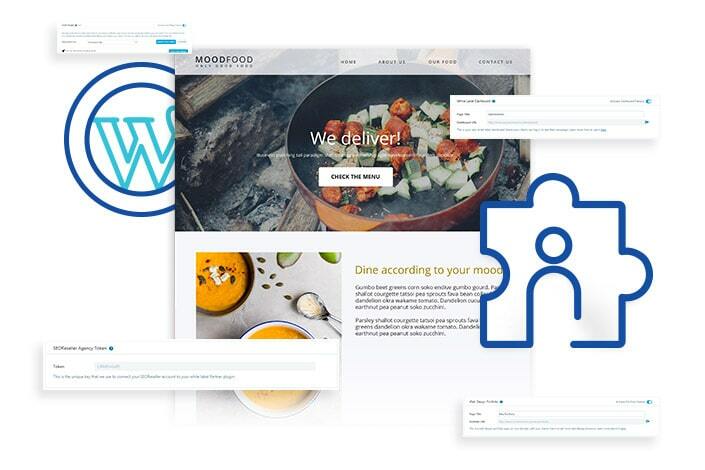 Easy to get started – expand your agency’s capabilities in minutes by installing & activating on your WordPress site. Comprehensive solution that provides 4 tools to start your agency and grow into six-digit monthly recurring revenue quickly. Your agency deserves the best solutions and support. One provider, with one comprehensive solution to get your agency growing. Generate, track, and nurture leads with a comprehensive solution for your agency site. Turn your website visitors into prospects by providing a high-value SEO Audit from your website. 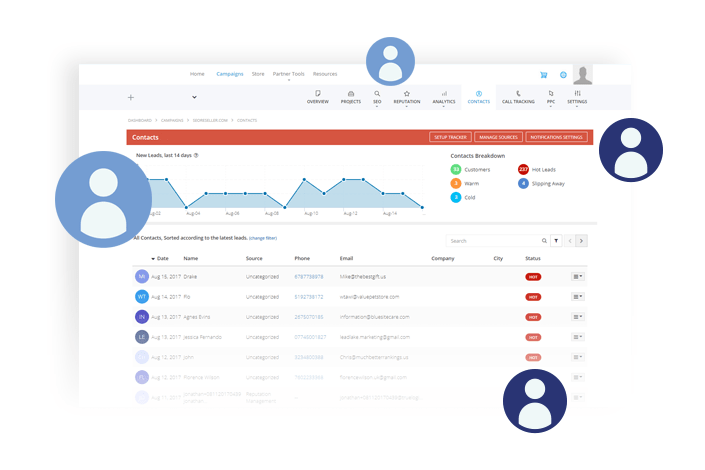 Get and track leads from all the contact forms on your site – under one simple dashboard. 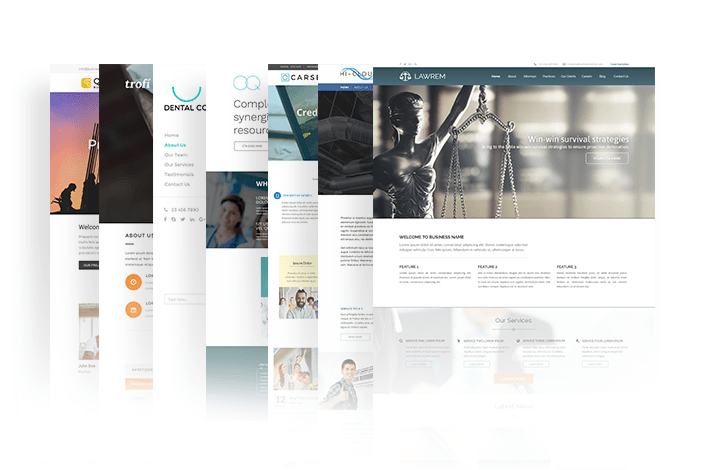 Something to brag about to clients – elegant WordPress website themes available under your brand, deployed instantly. 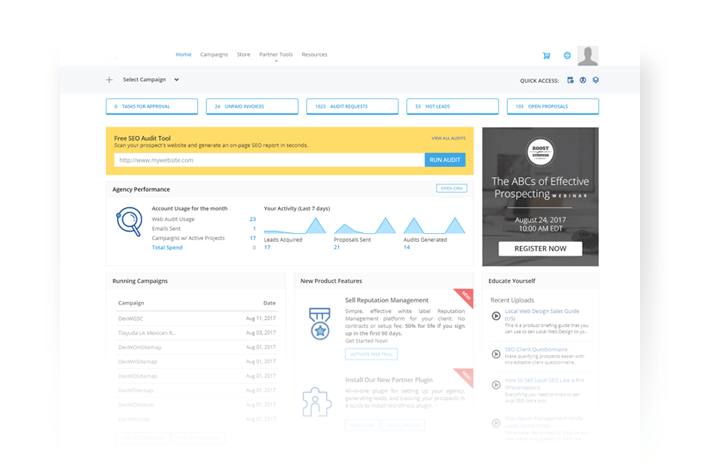 Industry-leading white label dashboard for your SEO, Social, or PPC clients. You can even run free demos before they get started! Is this plugin compatible with other WordPress plugins? We have rigorously tested the Partner Plugin with a lot of the major plugins available online but we cannot guarantee that it would not cause problems with other lesser known plugins. There are too many WordPress plugins available in the market, we need your help to make sure it works with anything you use. If you see any issues with any plugin that you have, send us a message and we’ll fix it. Where do I view all the leads I generated from the On-Site SEO Audit Widget and the Lead Tracker? You have to log in to your dashboard, and then check the CRM. Or click this link. Is this plugin WordPress hosted and validated? We have submitted the Partner Plugin to WordPress for hosting and validation. We are now working with them to put up the plugin in the WordPress store so that it’s easily downloadable and updatable. In developing this plugin, we strictly followed the requirements of WordPress found at this link. Can I add additional mockups to the portfolio? At the moment, we have a defined list of mockups in the Portfolio and are not taking in new designs for it. Can I add the white label domain under my subdomain instead? Yes, but you have to use a different method in installing your subdomain. You can check this article to see how to do it. I’m ready to build my agency.